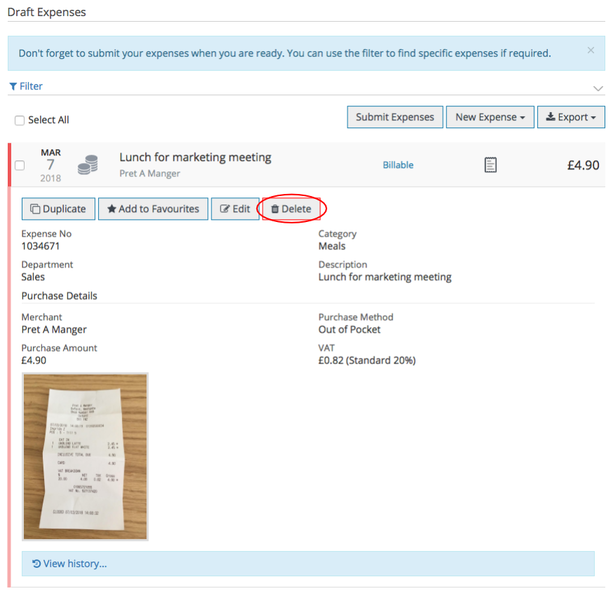 You can delete expenses in the Draft expense area of your account. You can only delete expenses within the Draft section of your My Expenses account. If you delete an expense the attached receipt will be deleted too. If you would like to delete a submitted expense, you can recall it back to the Draft area. 1. In the Draft area on the left-hand menu click on the expense you would like to delete. 2. Review the expense details and click the Delete button when ready. 3. A pop-up box will appear asking you to confirm you wish to delete the expense. Click Continue. Alternatively, you can Select All or multi select the expense(s) you wish to Delete within the Draft section. Once you have selected the expenses you will see the Delete button becomes available.